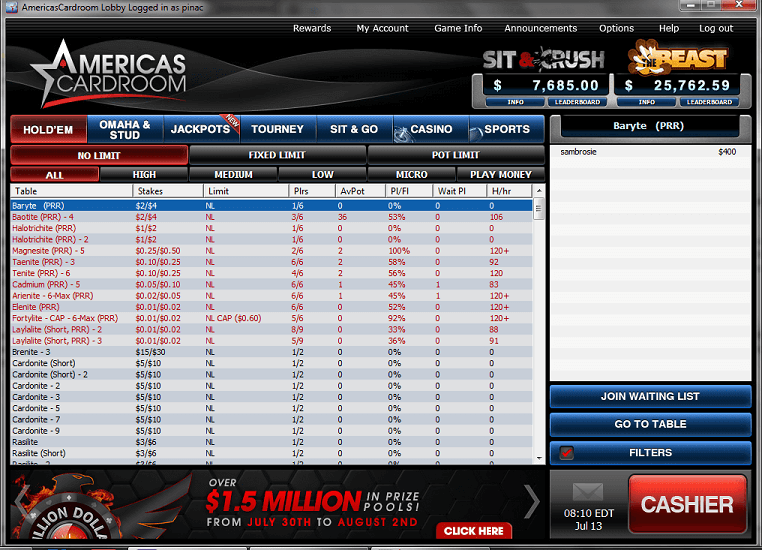 Americas Cardroom as we now know it has been around since 2011, but the company was around a decade before that. ACR came about when their parent company purchased the old “DoylesRoom” a few years back when it was floundering. In an industry that has seen its fair share of scandals from time to time, this online poker room and the company backing it have both been scandal-free for 14+ years, and the old “DoylesRoom” has been reworked to give players a much better experience than they were getting under old management. Overall, this is a top option for US players given the 27% rakeback and wide variety of promotions. 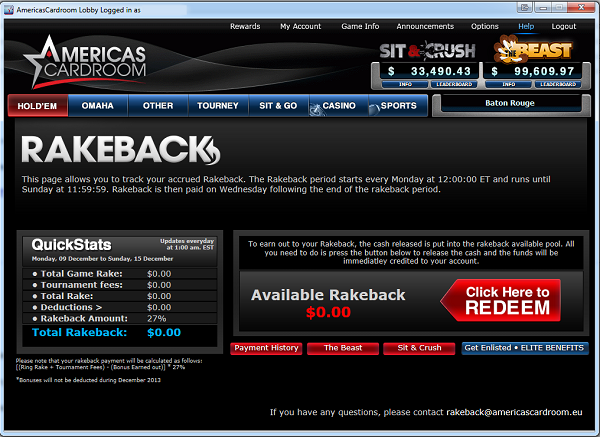 For US players, Americas Cardroom rakeback is on par with about the best you’re going to get when you take into account the extra promotions and excellent game selection. The basic rundown is that you’ll get a flat 27 percent no matter what stakes you play, and you can add that cash to your account any time you choose. This eliminates long wait times that have turned a lot of people off of getting good rakeback deals at times. As you can see from the screenshot above, claiming your rakeback is built directly into the software, so there’s nothing special you’ll have to do to get it other than log in and press the button to have it added to your account. 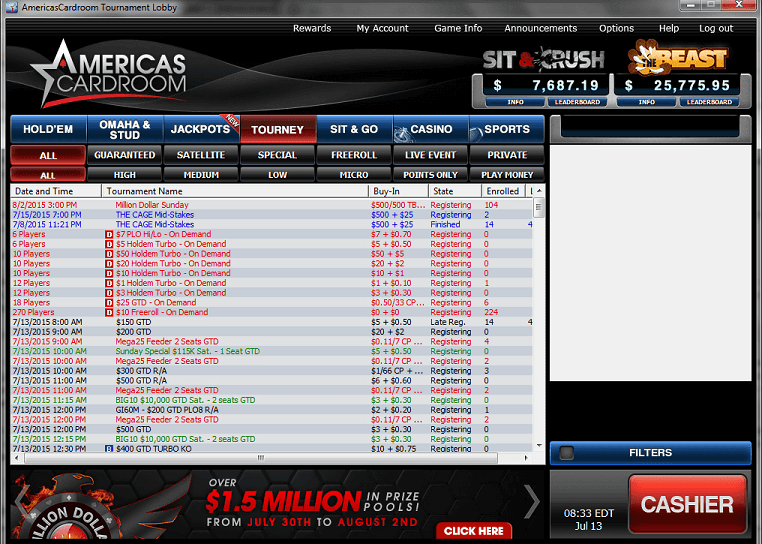 One common theme you’ll find in this ACR review is that everything about this poker room is solid. The Winning Poker Network hosts a handful of top sites that are known for their reliability and network-wide promotions. There are four main sections for the tables. 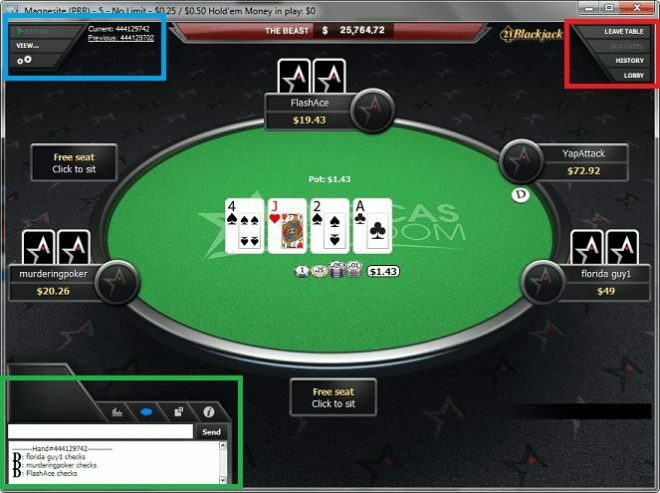 In the middle, you have the main playing section, and as you can see from the screenshot above, the players at the tables are very clearly marked. As we said earlier in this Americas Cardroom review, you’re going to find that everything is solid at this poker site, and that includes the little details that make a difference like clearly-marked cards in front of players. This is a lot different than some poker rooms with cards that blend into the table too much, making it difficult to tell who is still in the hand. In the top-left section (marked in blue), there are clearly marked buttons for checking hand histories and replaying recent hands, and there’s also an easy-access settings button. The top-right section (marked in red) includes options to leave the table or see the lobby without leaving the table, and the bottom-left section (marked in green) includes all of your chat options, player notes and table information. Table Background (Red Arrows): There are 16 standard backgrounds to choose from, and they include everything from plain black on black to beach scenes and a number of other colorful and relaxing options. Card Backings (Purple Arrows): The backs of the cards need to stand out from your background in some way, and that’s why they don’t use a one-size-fits-all approach here. 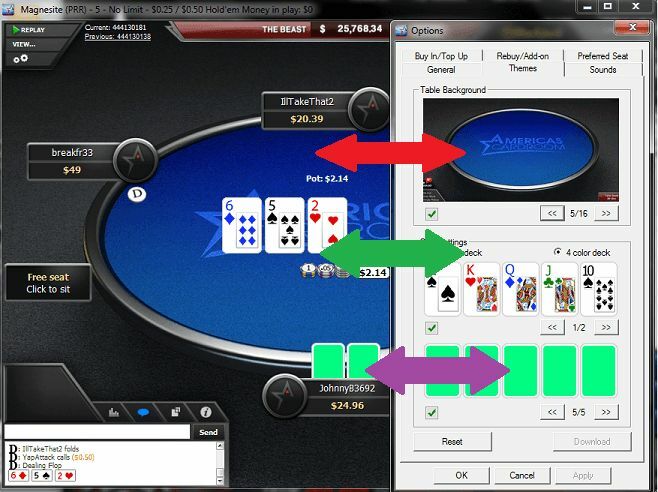 You have five different options for card backings, including the standard Americas Cardroom logo. Multi-Color Decks (Green Arrows): You can also choose between two-color decks or four-color decks. The advantage of the four-color deck is that it helps to eliminate situations where you misread suits, which costs you money. These customizations are on top of the standard options such as preferred seats, automatic top-ups, automatic buy-in levels, sound adjustments, etc. Everybody knows that no-limit hold’em is the only type of poker most people play online today. However, NLHE is offered in so many different formats now that it’s important to note your different options for stack sizes, table sizes, etc. As a part of this ACR review, we’re going to look at the game selection that this site offers. For their no-limit hold’em cash games, the basis of any online poker room today, they have tables available from $0.01/0.02 up through the standard $25/50. Short-stacked, full-stack and cap games are all available, and you can play at heads-up, six-handed and nine-handed tables as well. Fixed-limit hold’em games run from $0.02/$0.04 to $30/60, and a handful of pot-limit games are also available. The other two main types of poker that are spread are Omaha and seven card stud. You’ll find both the high and high/low versions of these games available in a wide range of stakes, but it’s the Omaha high tables that get the most action out of all four of these games. Most running games are pot-limit tables, but there are a few no-limit Omaha high tables that are active from time to time. If you’re a fan of MTTs, then what you’ll find in this Americas Cardroom review is that you’ll have tons of options to wet your beak. There are tabs for several different levels of stakes as well as tabs for different types of tournaments (guaranteed prize funds, satellites, freerolls, etc. ), and you can easily sort by start time, buy-in and other filters. Though they have a ton of tournament options, they make it really easy for you to find exactly what you’re looking for. The following is a basic breakdown of their guaranteed prize pool schedule for Monday through Friday. Saturday and Sunday have slightly different schedules, though it mostly reflects larger guaranteed prize pools. Lots of promotions run at this poker room that are great for players at all different stakes. On your first deposit, you’ll get a 100 percent match up to $1,000. This bonus is cleared at a rate of $1 per 27.5 reward points, which is the equivalent of $1 per every $5 taken in rake. Six different levels based on base points (RP) earned. Earn spendable points (CP) based on your base points * your rank modifier. Use CP to purchase cash and other goodies from their Elite Benefits store. Can also buy entries to online tournaments or live events. Regular freerolls available for all Elite Benefits players. Finally, there is the Beast leaderboard promotion. You’re automatically entered into this promotion each week, and there is no cost for taking part. The idea is that you earn points based on your real money play in cash games or tournaments, and the top positions are paid cash and prizes on a weekly basis. You can win up to $2,500 each week with this promotion. Every Friday Rakeback.com runs Twitch giveaways for its tagged players, read more here. While one of the main weaknesses of US online poker has been payments, Americas Cardroom delivers fast and reliable withdrawals. As far as bitcoin deposits go, they aren’t held in actual bitcoin since this poses certain volatility risks. Instead, they are converted into US dollars based on the current exchange rate when depositing, and your funds are converted back into bitcoin based on the exchange rate at that point in time when cashing out. Questions about this room? Tweet @rakebackcom or contact [email protected] 24 hours a day.